The EU Habitats Directive requires an ‘Appropriate Assessment’ (AA) to be carried out where a plan or project is likely to have a significant impact on a Natura 2000 site. Natura 2000 sites include Special Areas of Conservation (SACs) and Special Protection Areas (SPAs). An AA follows a stepwise process of up to four successive stages that need to be observed in establishing whether a plan or project can be implemented without damaging a Natura 2000 site in accordance with articles 6(3) and 6(4) of the EU Habitats Directive (see Figure 1). Any development which has the potential to impact on a designated SAC or SPA must initially be screened for AA. It is the responsibility of the competent authority (or consent authority) to undertake AA. The competent authority (usually a local authority) may require the proposer (applicant) of a plan or project to present an Appropriate Assessment Screening Statement upon which they can consider when undertaking the AA. The screening statement assesses the potential impacts of the proposed development without considering mitigation. Should the screening statement conclude that potential adverse impacts cannot be ruled out then the applicant may be required to prepare a Natura Impact Statement (NIS) to further assist the competent authority in the decision making process. The NIS may include mitigation and recommendations to avoid or reduce the significance of potential impacts. 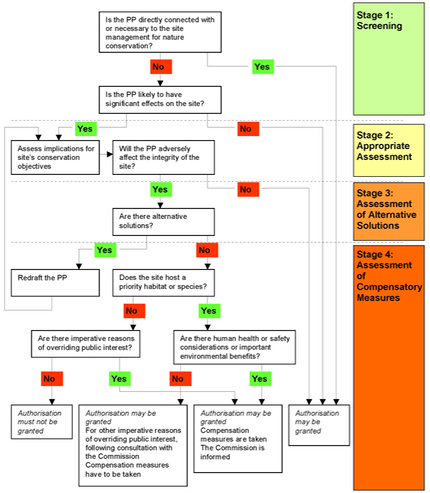 Figure 1: The stepwise process of Appropriate Assessment as outlined in ‘Assessment of plans and projects significantly affecting Natura 2000 sites: Methodological guidance on the provisions of Article 6(3) and (4) of the Habitats Directive 92/43/EEC' European Commission 2001.�Notes: ‘PP’ in Figure 1 is abbreviation for ‘Plan or Project’. Wetland Surveys Ireland have prepared a number of Appropriate Assessment Screening Reports and Natura Impact Statements for developments throughout Ireland ranging from the installation of small scale one off housing developments to large scale regional infrastructural projects on behalf of semi-state bodies. Further details on our recent project experience of Appropriate Assessment can be seen here.